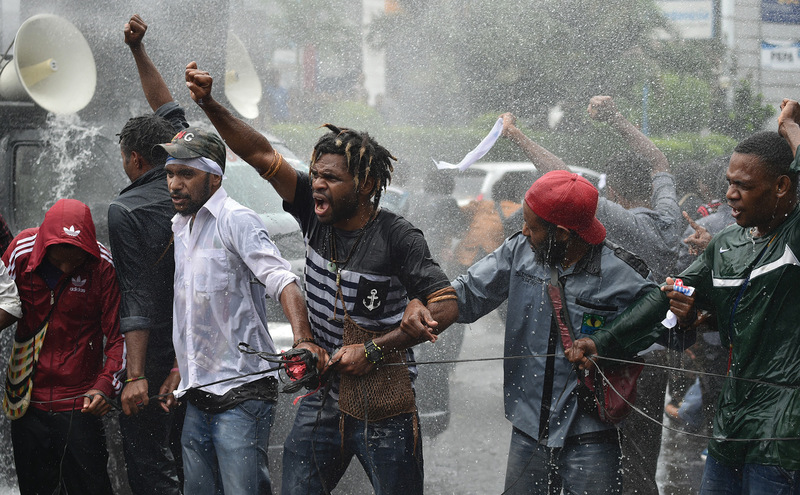 University students from the Free Papua Organization and the Papua Student Alliance resist police using water cannons during a protest in Jakarta, 1 December 2016. Smuggled under the cover of darkness. Hidden among innocent-looking deliveries. Carried by people not known to the authorities, by volunteers along jungle paths, to highland villages unreachable by motor vehicles. Thousands risked their freedom – and their lives – to spread it in secret across a nation. It’s a lot more effort than we would usually expect to collect signatures on a petition. But this was no ordinary petition – it was a call for human rights and indigenous self-determination in a region where such sentiments are strictly banned. The Indonesian government is determined to hang on to the region of West Papua – a territory which it has occupied by military force since 1963 – and dissent by its indigenous peoples is frequently met with intimidation, violence or arrest. Simply raising the West Papuan Morning Star independence flag could result in 15 years of imprisonment. Distributing a petition calling for an internationally monitored independence vote for the West Papuan people is, in the eyes of the Indonesian state, similarly treasonous. 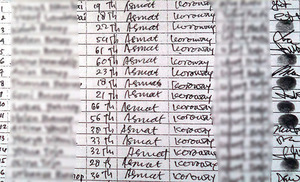 The petition campaign ran from May to July this year. According to the Free West Papua Campaign, 57 West Papuans were arrested during that time for supporting the petition, and 54 were tortured at the hands of Indonesian security forces. One West Papuan, Yanto Awerkion, is facing a 15-year jail sentence for organizing a gathering in support of the petition. It is therefore all the more extraordinary that – in just three months – a staggering 1.8 million people signed it. Seventy-one per cent of the indigenous West Papuan population placed their signature – or thumbprint – on paper, in defiance of the occupying regime. Around 100,000 Indonesian settlers living in West Papua also signed in solidarity with the Papuan population. This result has a huge historical resonance. In 1969, Indonesia’s military occupation was ‘legitimized’ by the ironically titled Act of Free Choice, when 1,026 indigenous West Papuans were hand-picked by the Indonesian military, marched to polling stations at gunpoint and ordered to vote to be part of Indonesia. Indonesia’s claim on West Papua rests heavily on this fraudulent event involving less than 0.2 per cent of the population. Now, via the People’s Petition, the overwhelming majority of West Papuans have risked their life and liberty to call for a new, independently monitored freedom vote. The contrast with the 1969 sham ‘referendum’ could not be starker. From May to July, the bulk of other demonstrations and protests were put on hold as West Papuan activist networks focused their efforts on spreading the People’s Petition across the nation. The first response from Indonesian officials was to denounce the petition as a ‘publicity stunt’. This is unsurprising, as accepting the legitimacy of the petition would put the Indonesian state’s hold on power in West Papua at serious risk. The West Papuan people have made their position clear: they have roundly rejected Indonesian rule. Now it is the responsibility of the rest of the world to listen to their voices and support their clear desire to determine their own fate. Danny Chivers is a writer, campaigner, performance poet and author of two NoNonsense guides for New Internationalist: Climate Change and Renewable Energy.